I’ve eaten shrimp all of my life in so many different forms. Grilled, fried, stewed, baked, stuffed, with the shell, without the shell, in a sauce, on pizza, with pasta, you name it. 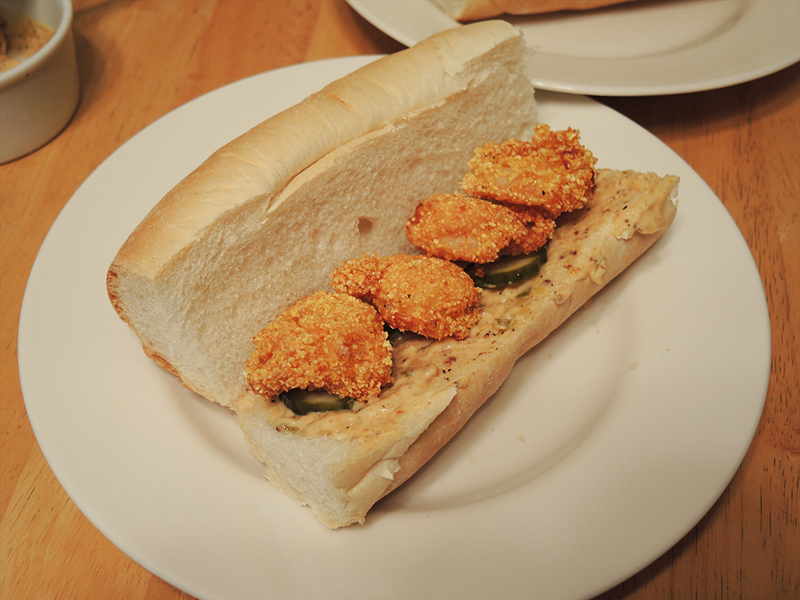 When I’ve had shrimp sandwiches, none were better than the shrimp po’ boys I had in New Orleans. Grilled shrimp on a po’ boy sandwich are good, but the fried shrimp po’ boy really stands out as what represents a po’ boy in my mind. Po’ boys have evolved over time to include a vast variety of sandwiches. There are roast beef or baked ham po’ boys with gravy. 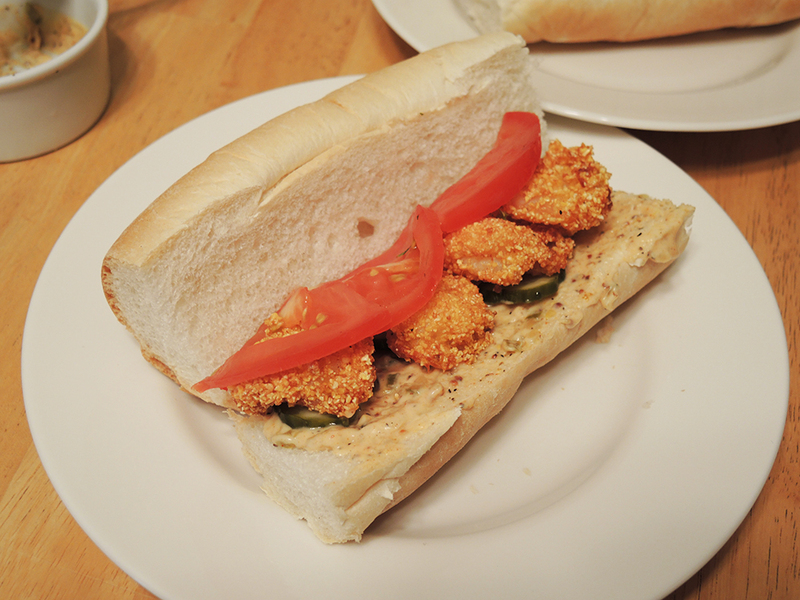 There are seafood po’ boys covering grilled or fried fish, shrimp, and oysters. There are even po’ boys that are made up entirely of just french fries in french bread with gravy. While there are many ways to make a po’ boy, the most traditional are meats with gravy or fried seafood with mayo, lettuce, tomatoes, and pickles all served on French bread. Nonetheless, po’ boys are versatile and you can switch up the ingredients without causing too much harm. You can have the sandwich with nothing but the meat or seafood or with mustard instead of mayo or even with cabbage instead of lettuce. The one true constant is that you should find the kind of po’ boy that you love and eat it whenever you can! 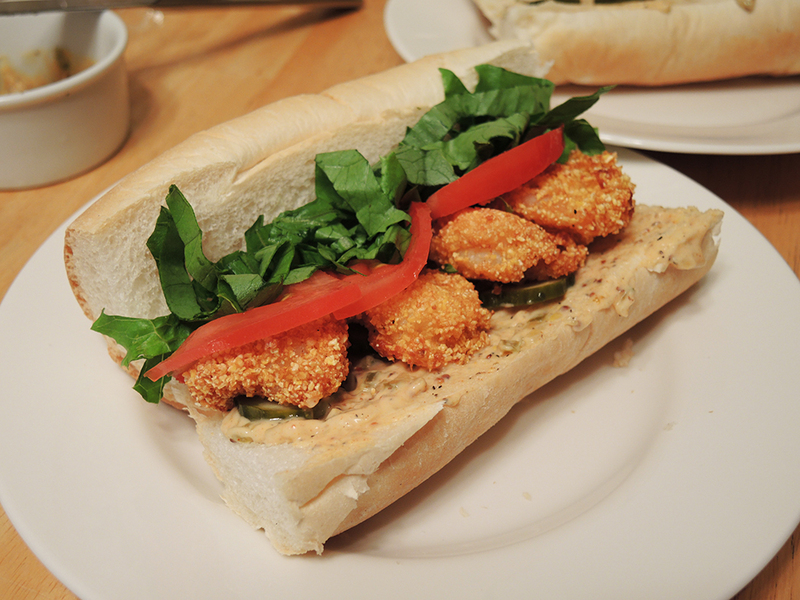 This recipe covers how to make fried shrimp, which you can then use to construct a delicious po’ boy. 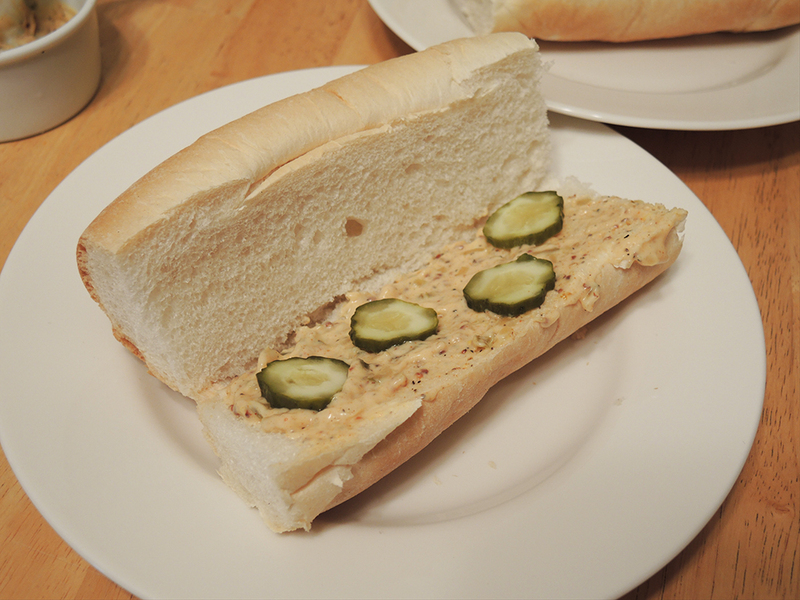 In the recipe, there is also a homemade remoulade sauce (spicy French mayo or aioli based sauce) that you can try out, but you can also just use plain mayo or yellow mustard on your sandwich if you prefer. In this recipe I also suggest a potentially blasphemous idea that you can swap the French bread for a Portuguese roll without causing too much harm to the universe. That is up to you though. In any case, this sandwich is delicious and even if you don’t make the sandwich, just fry the shrimp and eat them on their own! 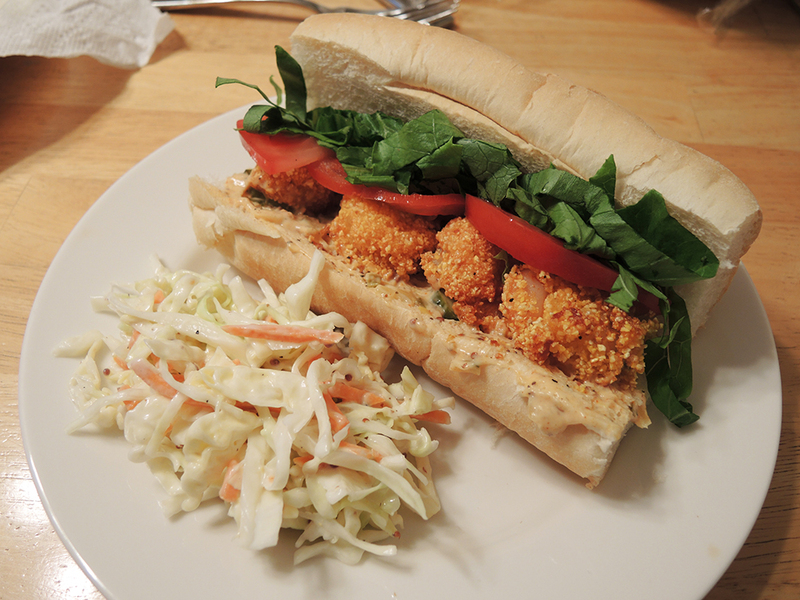 Tender fried shrimp po boy. Note: True po’ boys are made with New Orleans Style French bread, so use that if you can find it, but I’ve found that a tender baguette or even a fresh Portuguese roll will do in a pinch. Note: The famous restaurant, Mother’s, in New Orleans uses green cabbage instead of lettuce, but Parkway Bakery and Tavern – my favorite po boy place of all time – uses lettuce. 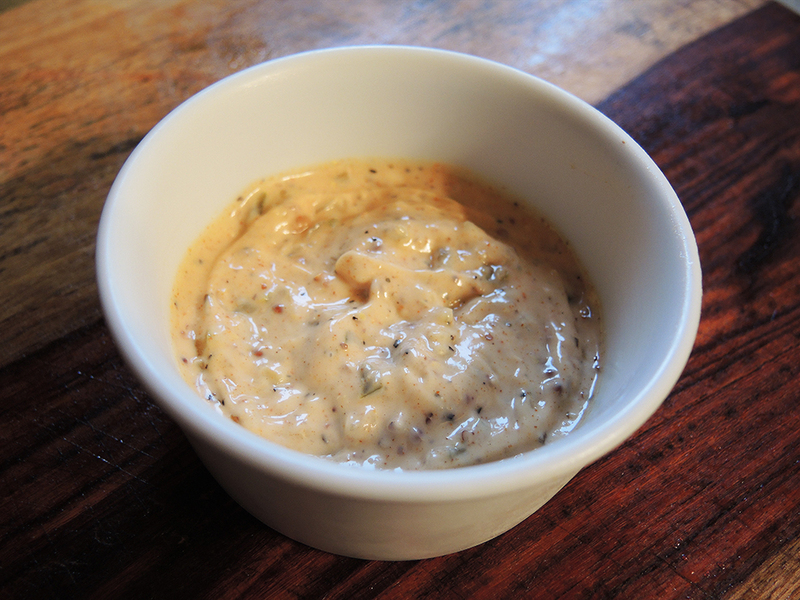 Remoulade Sauce: I hope this doesn’t discourage you because of how complicated these sauce directions are, but… mix all of the ingredients for the Sweet and Spicy Remoulade Sauce together in a small bowl or ramekin. Cover the sauce with plastic wrap and put it in the fridge until you’re ready to use it. Prep the lettuce and tomatoes by finely shredding the lettuce and slicing the tomatoes. You’ll need about 2 – 3 slices of tomato per sandwich. The next big step is to get your shrimp ready. That means if you bought it frozen, defrost it in cold water. If it’s already defrosted, then make sure to peel and devein the shrimp (here is a nifty video for how to devein shrimp). 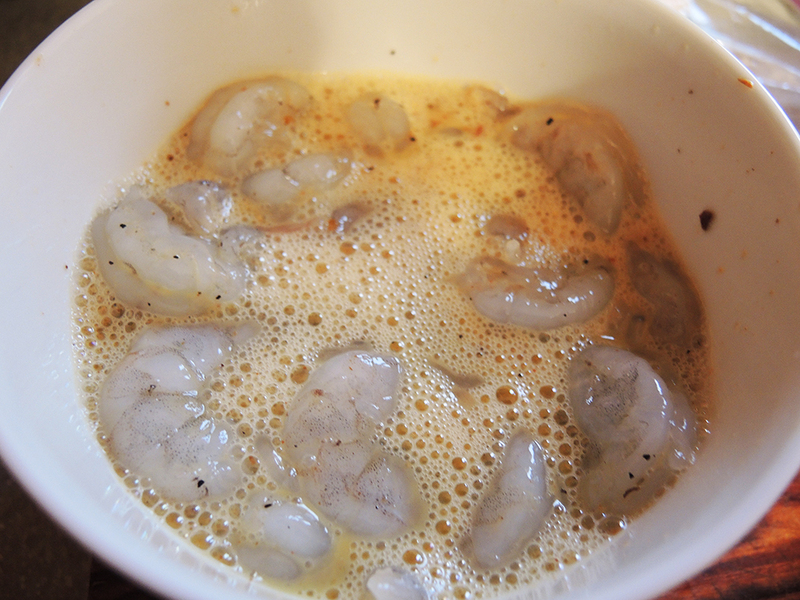 If you’re like me, you found a bag of frozen, pre-peeled, raw shrimp that makes life super easy. 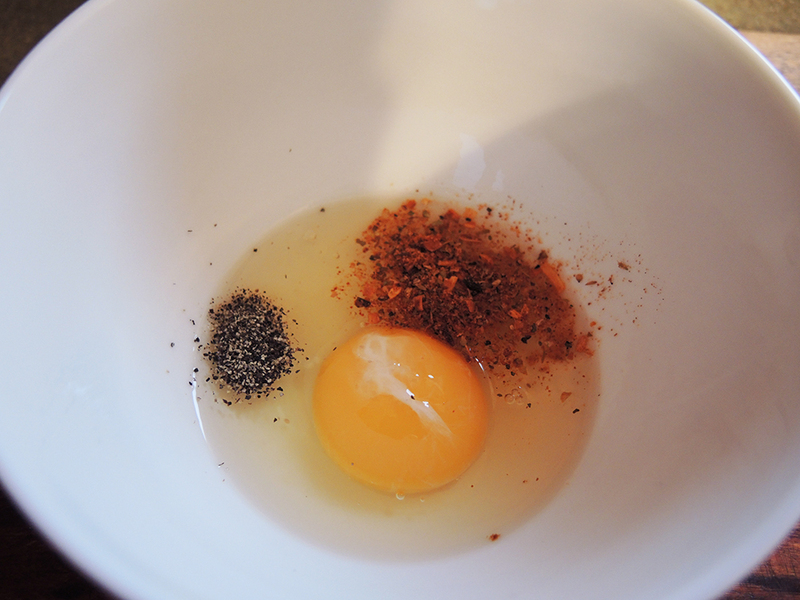 Next, crack an egg into a small bowl and combine the yolk with the black pepper and cajun spice to prepare the egg wash.
Use a fork to mix the egg really well with the spices. 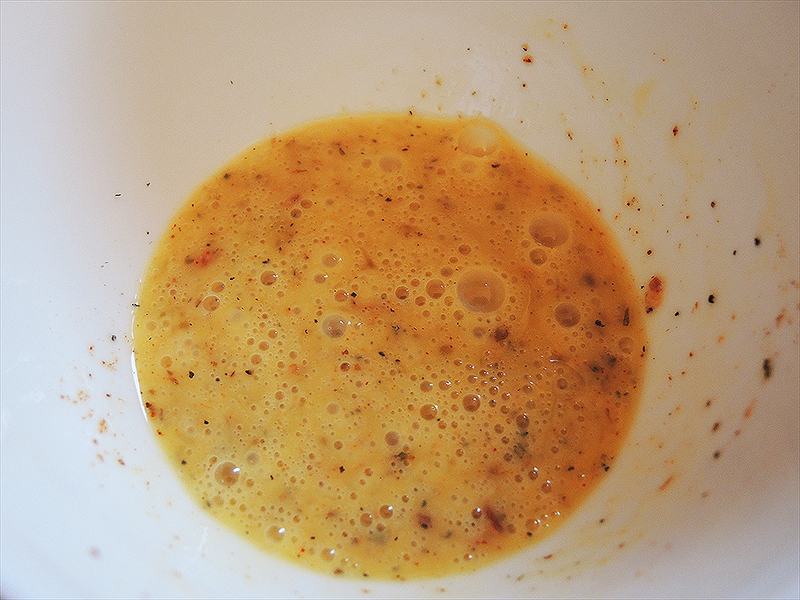 Place all of the shrimp into the small bowl with the egg wash in it and mix the shrimp with the egg. 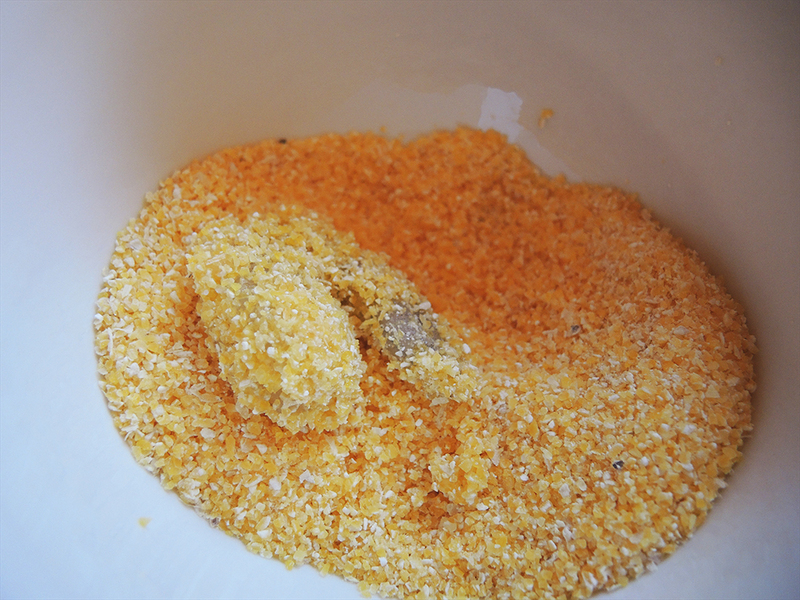 In a another small bowl or on a small plate, place 1/4 cup of fine cornmeal or flour. 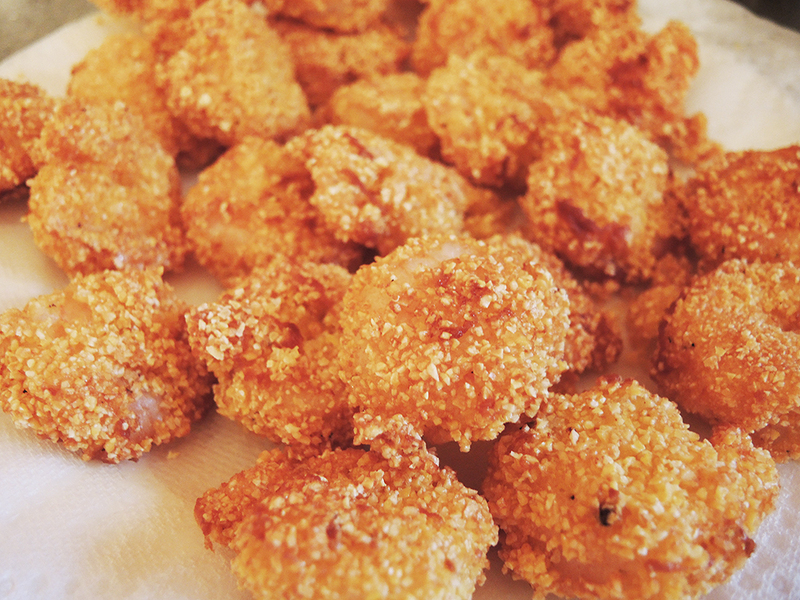 Then take one shrimp at a time and dredge it in the breading. 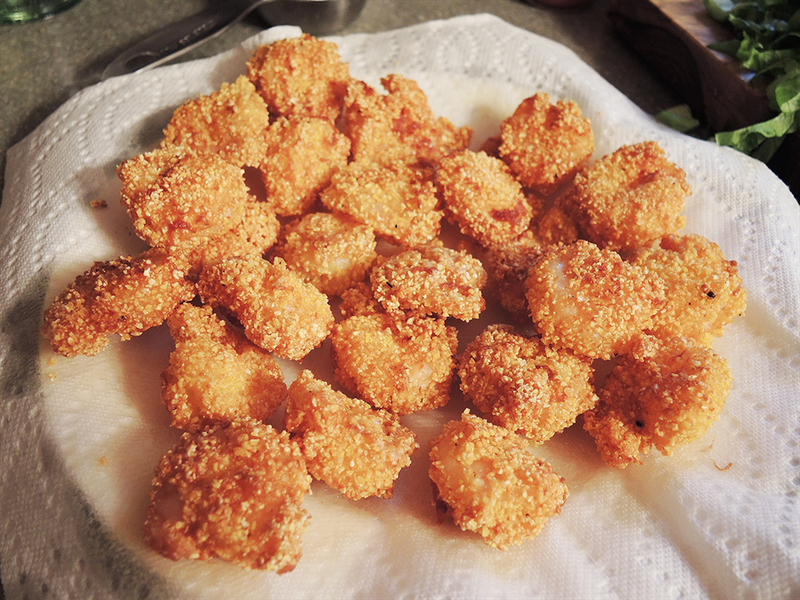 You may be tempted to just toss all of the shrimp in the cornmeal/flour, but I don’t suggest you do that. It is harder to fully coat all of the shrimp when they are all on top of one another. The moisture from the shrimp also gets into the breading and makes it clump up, which essentially keeps it from sticking properly. Take your time and go one by one. Repeat this process until all of the shrimp are coated with breading (yes, I’m aware that there are more than 12 shrimp in the picture). 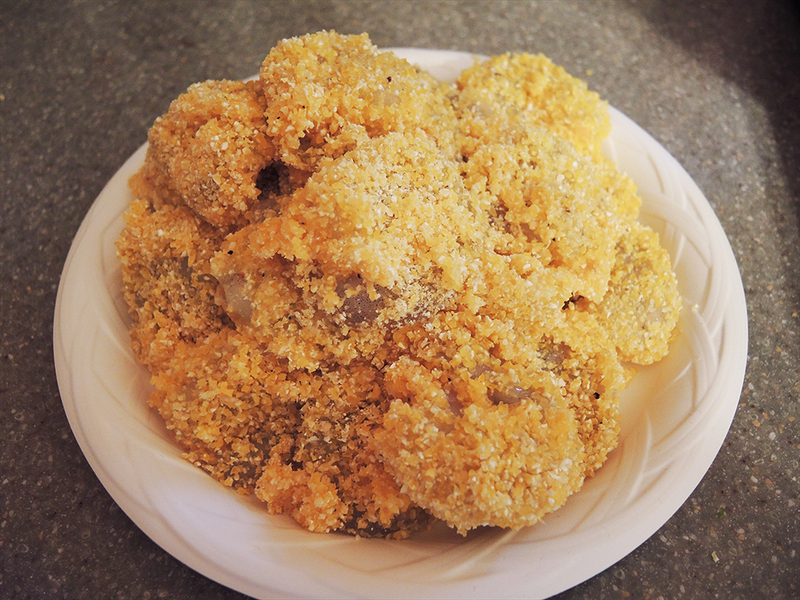 Put the oil in the pan and get it heated to medium high on the stove or up to 350 degrees F if using a deep fryer. 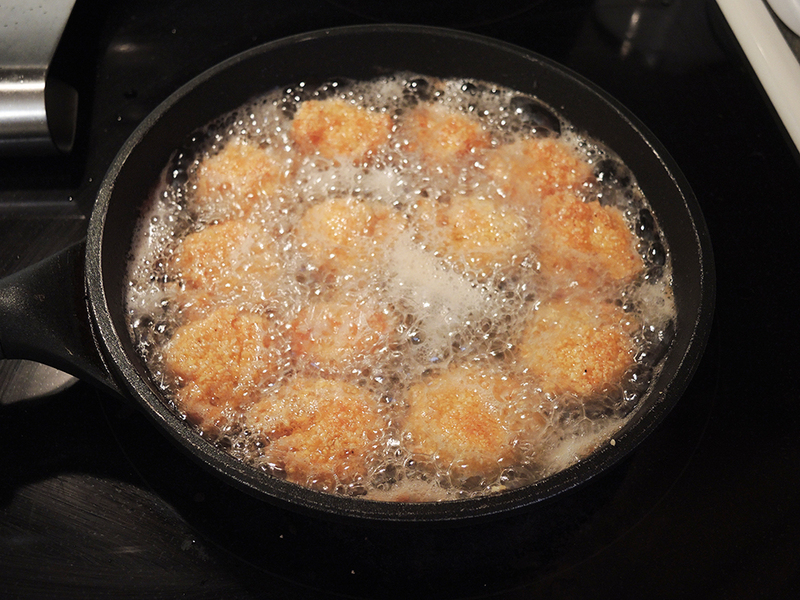 Once the oil is heated, start putting in shrimp to fill the pan, but without the shrimp overlapping. You can tell the oil is ready when it starts to ripple a bit or when you put the tip of a wooden spatula in the oil and bubbles form around the wood. After 3-4 minutes or so, use tongs or a spatula to flip the shrimp to finish cooking on the other side. The shrimp are done when they are a deep golden brown. You may need to flip them more than once if you flipped them too early the first time. On a tray or large plate, lay down a sheet or two of paper towel. 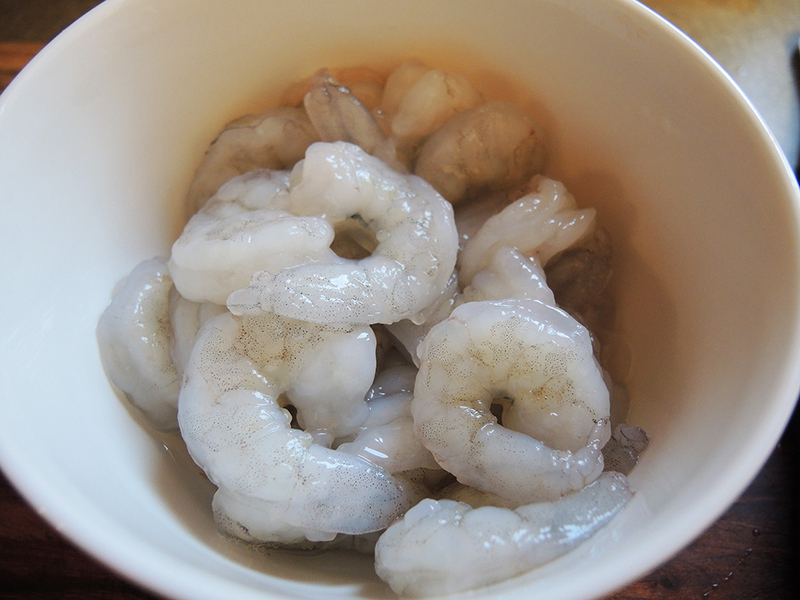 When the shrimp are done place them on the paper towels to absorb any excess oil so that the shrimp stay crispy. With the shrimp done, it’s time to assemble the sandwich. 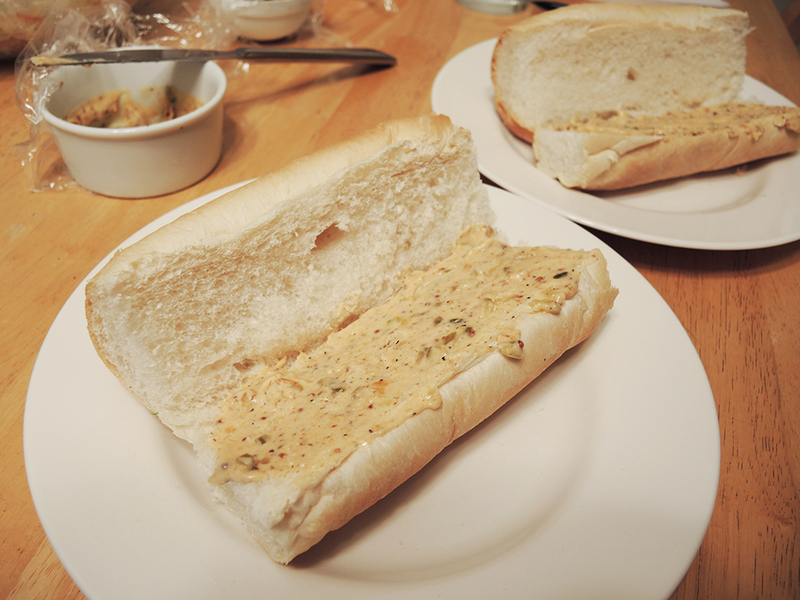 Start by cutting a baguette or Portuguese roll down the side and creating a hinge in the bread. You can slice all the way through, but I don’t personally like that. If you want you’re bread a little crisper, make sure to put it in the oven or toaster oven for a few minutes before making the sandwich. Choose your condiment and spread 1 to 2 tablespoons of the Sweet and Spicy Remoulade sauce, or mayonnaise, or yellow mustard on the bottom of half of the bread. If you like pickles, I suggest some deli-style pickle slices next. Next comes the shrimp. You don’t want to over-fill the sandwich, but 4 to 6 shrimp should fit pretty well. If you like tomatoes, then layer some slices on top of the shrimp. 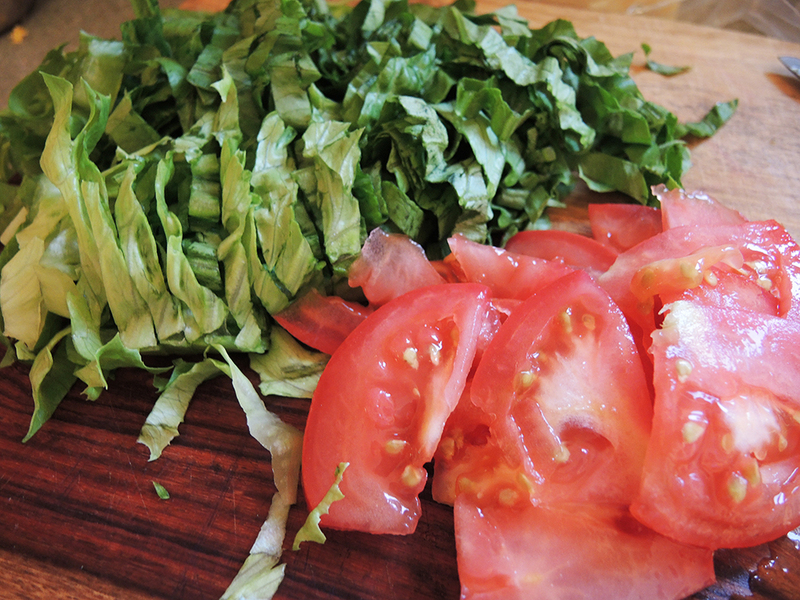 Lastly, top the tomatoes with shredded, green Romaine lettuce, iceberg lettuce, or green cabbage. Pair the sandwich with any Southern side like homemade Collard Greens, Red Beans, potato salad, or coleslaw and you’re ready to eat! Nicely done! This looks fantastic. NOW you have my interest !! Well done.